Shouldn't that be: "WAAAGH CHOICES!!!!"? Sorry didnt actually mean to type buy some, though of course you should always buy more GW merchandise shouldnt you? I meant to type field them. Oh and I have a bunch of gobbo bits from a regiment. I have no idea if the bits are of any use to you but I am having a massive clear out tomorrow and thought of you. yeah, remind me again on tuesdat though! doh! Forgot to paint half a troll... have to do tonight! Hope you are all sitting down to read this.. Tonight I start Gamezone Chariot no.2! 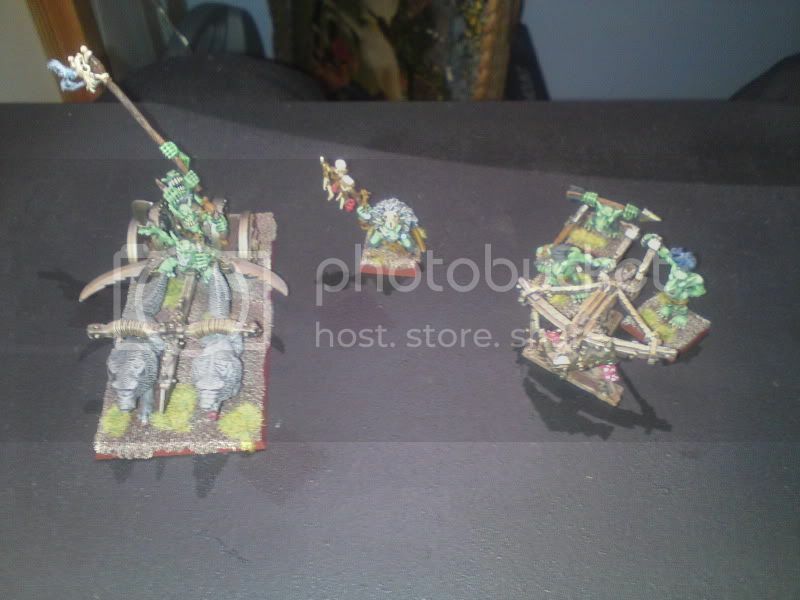 Clearly I'm a loon (guess there's no one surprised at that statement though) but there is a reason..
For 1500 I'm going to trial Grom the paunch, so I need a big chariot for the lovely model from avatars of war, the GW chariot is too small so a stripped down Gamezone chariot is the answer. It's an ambitious conversion (ish) for me with a mix of GW goblins, an avatar of war model and the most difficult chariot in creation to build, but I hope it will all come together niceley (Ha!) I'll try to keep a photo log together which I'll post up here time willing.